Of all the naturally occurring wonders of the world, geothermal hot springs may be the most alluring. Touting numerous health benefits, from soothing aching muscles to boosting circulation, the healing power of hot springs has been used for centuries. When you add in a serene outdoor setting, there may not be anything better. 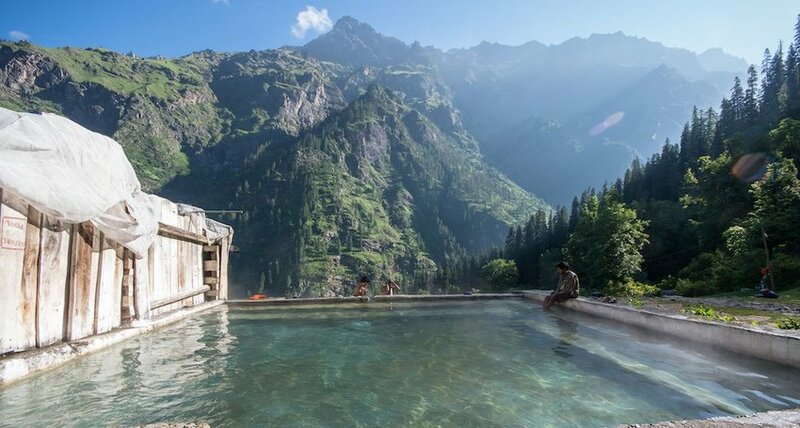 From lush jungles to Himalayan mountaintops, here are the five most beautiful natural hot springs in the world. 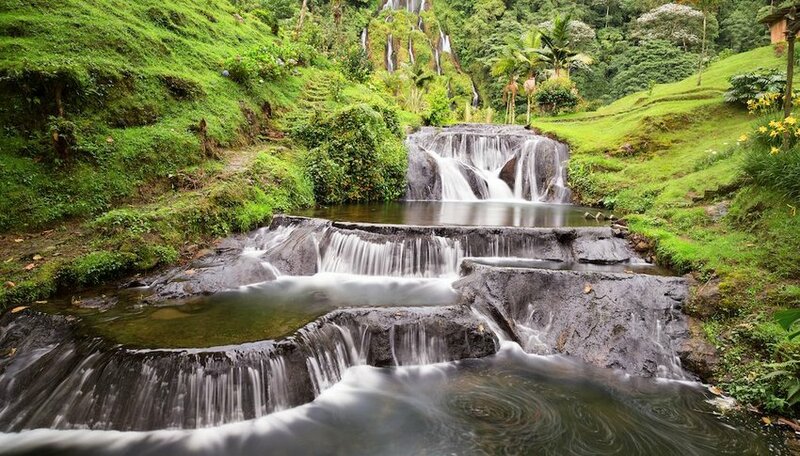 These “termales,” or hot springs, can be found by taking a bumpy back road to the depths of the Colombian jungle. Upon arrival, visitors will be greeted with a magnificent waterfall tumbling down a lush mountaintop, and from there it just gets better. 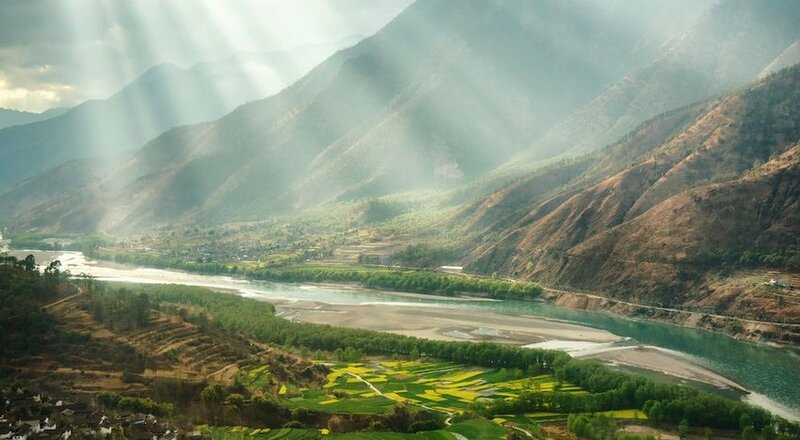 Tourists can explore the area by hiking along the natural hot springs, which includes more waterfalls, babbling brooks and surrounding verdant land. When you’re ready for a soak, the pools are fed by cascading natural hot springs and have different temperatures for your choosing. 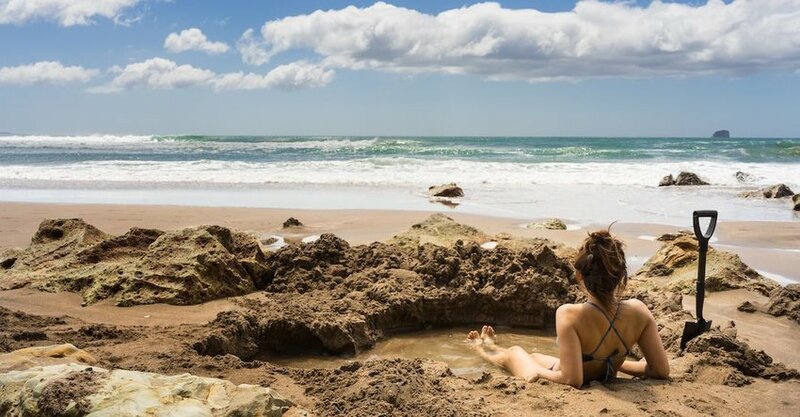 Tucked along Mercury Bay on New Zealand’s Coromandel Peninsula is Hot Water Beach, known to be one of the most unique hot springs in the world. Upon arrival to Hot Waters Beach, the coastline appears to be none other than a white sands beach, and a beautiful one at that. However, naturally heated mineral water is located beneath the white sand, and during low tide, this beach is turned into an outdoor spa. With a shovel and a little determination, you can dig your very own thermal spa pool. From there, you can soak in the sun and sand, with the glorious Pacific coastline stretching before you. 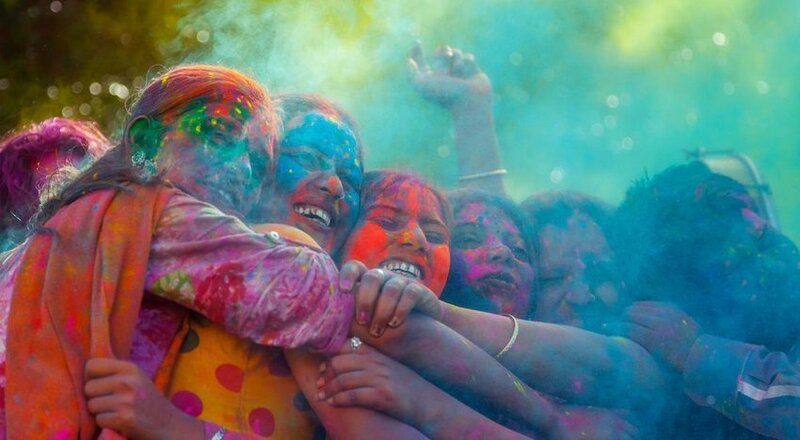 A trip to this remote natural hot springs, located in the northern Himalayas of India, is not for the faint of heart. To soak in these mystical springs that flow beneath the Shiva Temple, one must first hike 13 kilometers (that’s 8 miles) up the mountain, an exhausting trek that can take upwards of 7 hours. But soothing your aching muscles in this majestic location will make every minute of the trip worth it. 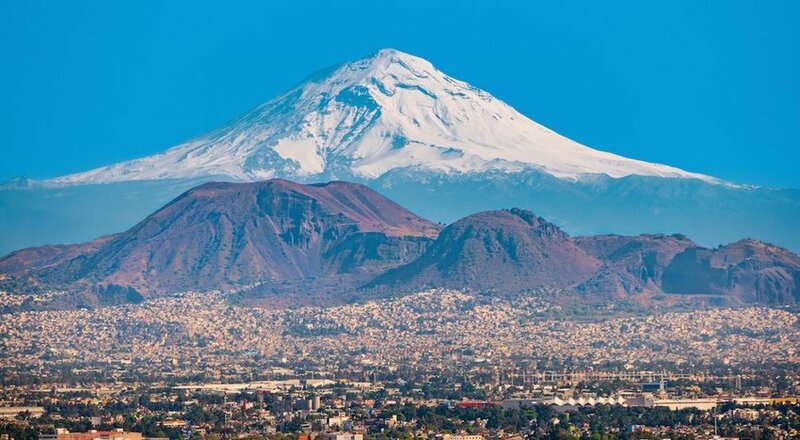 To avoid hiking down the mountain in the dark, tents are available for travelers who would like to stay overnight and soak to their heart’s content. 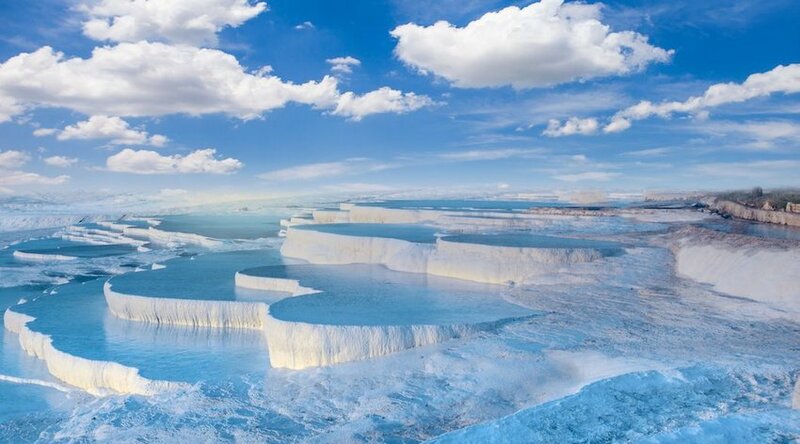 The hot springs in Pamukkale, Turkey, are a natural occurrence that draw millions of tourists annually. After a ruptured fault caused volcanic hot springs to rise, the hot water eroded the earth’s travertine, and the terraced hot springs were formed as a result. The bright white limestone of this UNESCO Heritage Site was the inspiration for the name Pamukkale, which translates to “Cotton Castle.” To prevent further erosion, shoes are not permitted on the terraced hot springs, but visitors may sit and splash in the shallow waters. Pamukkale is also home to the ancient Greek-Rome spa city Hierapolis, which contains a large mineral pool for soaking. This soaking pool is often referred to as the “Antique Pool” or “Cleopatra’s Pool,” as according to lore, Marc Antony gifted this thermal pool to his famous paramour. 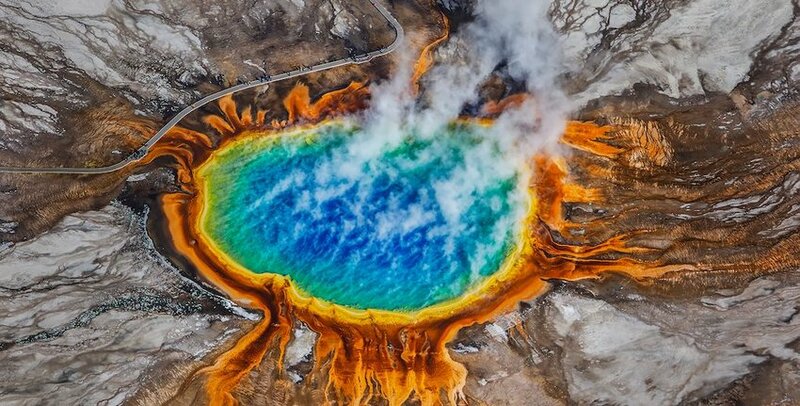 Of all the hot springs in the world, the Grand Prismatic Spring in Wyoming’s Yellowstone National Park might be the most impressive. As the third largest spring in the world, according to MyYellowstonePark.com, this geothermal phenomenon is bigger than a football field. The most stunning aspect of the Grand Prismatic Spring is just what it is named for — the subtle shifting of the spring’s colors resemble the prisms of a rainbow. Unfortunately, you can't take a dip in this one. However, if you really need to rest your aching bones, head north to the park’s Boiling River, a natural hot spring that mixes with the Gardiner River, making it an ideal temperature for a nice, long soak.